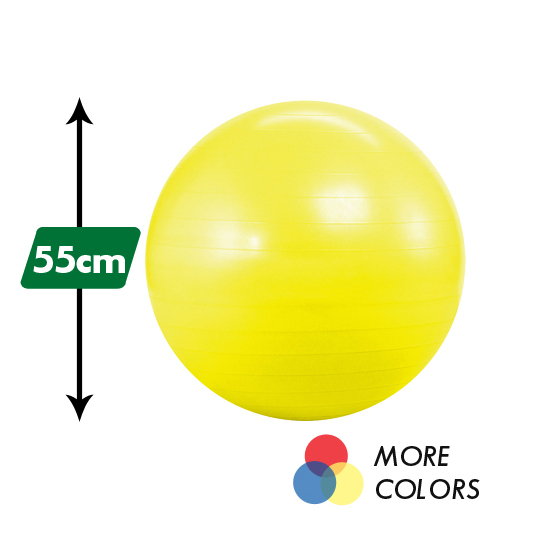 Our 55 cm Anti-Burst Yoga Balance Ball is recommended for shorter women: 4'7" to 5'3" tall. Our Pilates balls can withstand 600 pounds of pressure and are extra thick, so they won't pop or burst. Use them in conjunction with floor exercises to strengthen the core. Use under the feet in push ups for the ab workout of a lifetime! Or, improve posture while toning small muscles in the abdomen by using this resistance ball to replace your office chair! For shipping purposes, our Swiss balls come deflated so you can get them through your door. The kids will love to play around on them, too. Six fun colors to choose from: red, silver, purple, black, blue and yellow. Please note that the red yoga ball tends to fade into a dark pink color once it is blown up. Great product, it holds up well to exercise (and a bit of play with my dog). It stays inflated for quite some time, and provides good solid support for sit ups and core training but also for sitting at my home office desk. And, like I mentioned, I have a 50 lb dog and the two of us play keep away with this ball, which is both fun and funny - I get a great laugh every time we play! I signed up for a yoga class at my YMCA and they required us to bring our own yoga ball. I wanted a high quality affordable yoga ball and I found that with Yoga Accessories. I was pleasantly surpised when it came with pump. I am so satisfied with my purchase and I love my new class. I have been taking pilates on the ball for years at my local pilates studio when recently I had to move. I knew enough from taking class that I decided that I would take my practice home. I did some research and Yoga Accessories offered the best price for a yoga ball. I needed a new office chair and decided that I wanted to get a yoga ball for my chair. This way I can stregthen my center while I''m working. Sometimes during my lunch break I do some poses and exercises on the ball. It is made with strong thick vinyl and some of my co-workers have gotten a ball for their office chair as well. I have lost 5 pounds since doing this.